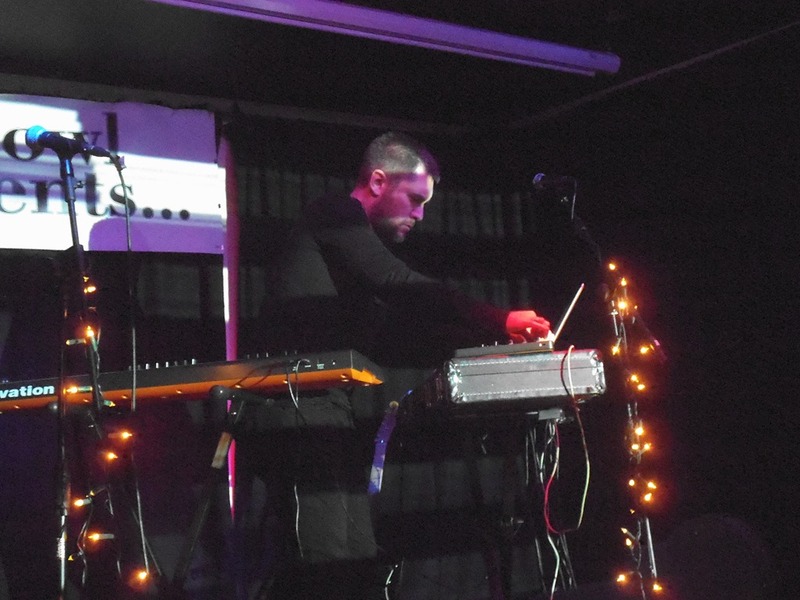 Leeds’ Post War Glamour Girls have already delivered one of the albums of the year with their second long-player, Feeling Strange, and attendant live dates have proven them to be – yet again – one of the most consistent and exhilarating live acts around. They’re ending 2015 on a high note, with a video release for album track ‘Count Your Blessings’. Brooding and moody, the song’s dark undercurrents and cinematic guitar sound are accentuated by a magnificently-shot video which is presents a bleak narrative with some unexpected twists. In many ways, Tom Morris is the man who got me into reviewing again after some years out, and I’ve been a follower of Her Name is Calla’s career since their 2006 tour with I Like Trains (or, indeed iLiKETRAiNS as they were then). However, despite having also followed Tom’s solo career, which has seen him release a prodigious volume of material under the name T E Morris (and not only does this material include albums and Eps, but a film score, a novel, and accompanying soundtrack), I had yet to witness one of his solo shows. It would have therefore been criminal to have missed his last one. The Fox & Newt is a new venue to me, and it’s a new favourite immediately on arrival: the beer, the bar staff, the venue space, the sound… It’s hard to fault the place. And so I’m settled at a table in a nice spot for the set of Andy Crowder, performing as Piles of Clothes. 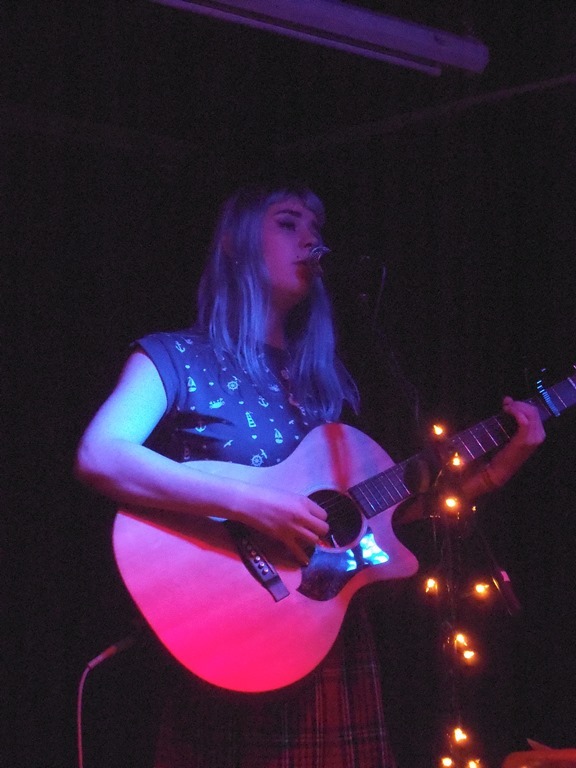 It’s an enjoyable, unprentious acoustic set consisting of nice, introspective and metaphor-laden songs, delivered with self-effacing humour. Fran Minney is immediately notable for her hair, but this is soon overshadowed by her reflective, personal songs, and above all, her quite outstandingly powerful voice. Hers is a style built on contrast, as delicate, reflective lyrics and delicate- and also dynamic –guitar playing provide the vehicle for her strong vocals. If I were to be critical, I’d say that the notes-per-bar quota stretches a little too readily into territory that is, at times, a bit Christina, but her voice is also noteworthy for its deeper tones and some grit and, truth bee told, belting rock leanings. I found myself torn. Honest, sincere, for sure, and with clear commercial potential, I couldn’t help but feel if this unpolished talent could be a shade ‘X-Factor’. Many would, of course, disagree. No matter, she has a charming, down-to-earth demeanour, some nice tunes, a strong voice, and a lot going for her. Thomas Ragsdale was one of the main reasons for turning up tonight. While his set effectively draws on the mood and fabric of his recordings, he’s by no means simply ‘playing the songs’ from his releases to date. Given that his solo work has been represented by a pair of soundtracks, it’s fitting that there are strong filmic qualities to the music of his live sets. What’s perhaps more surprising is that the visuals which accompany the performance are little more than projected patterns of light. And yet it works well, because too much by way of moving pictures or other visual stimulus, would likely detract from the music. As it is, Ragsdale’s crackle-soaked evocations, paired with retina-twitching, flickering visuals resonate within the subconscious, building layers which unfurl. Before he begins, he describes what will follow as ‘grim’, but this is rather disingenuous. The shadows and darkness are interspersed with moments of almost overwhelming grace and irrepressible beauty as he builds the set towards a climax where The Cure meet Tim Hecker. Tom Morris took a gamble with his t-shirt, but no-one’s here to check his sartorial choices. 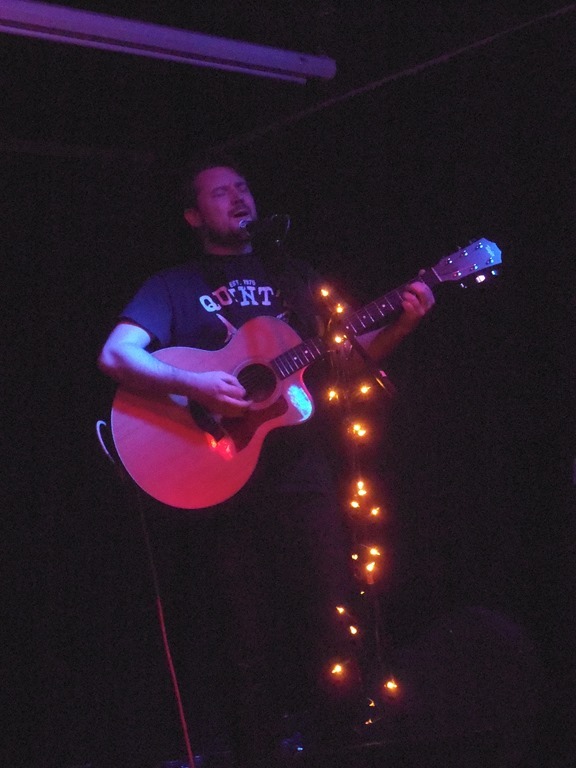 They’re here to hear his songs; those hushed, contemplative acoustic songs which have stood apart from his work with Her Name is Calla, and he opens the set with ‘Survivor Guilt’ from his second EP, 2011’s ‘An Ocean is Enough to Love’. For all of the anguish and the portent the songs are imbued with, and the fact they are by turned gloomy and tinged with despair, there’s beauty and light, too. Moreover, Tom’s performance is completely without pretence. He’s humble, and disarmingly open. He talks about the difficult personal circumstances that compelled him to perform solo in the first place, his lack of ability as a pianist, and his love of Lego. As an artist, Morris very much wears his heart on his sleeve, although combines this with more oblique lyrical turns and some magnificently understated guitar playing. ‘Long Distance Runner’, which was originally recorded as a Her Name is Calla track and released on the ridiculously limited cassette which accompanied some copies of The Heritage also serve to remind that Morris has a great voice, capable of hitting unexpected high notes to haunting effect. 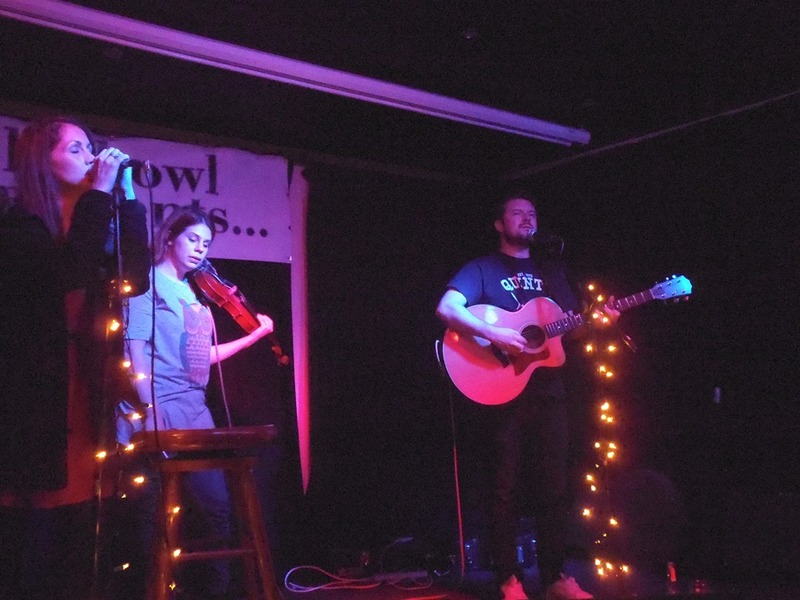 Tom’s acoustic guitar is augmented by the violin of HNIC’s Sophie Green for a couple of songs mid-set, as well as the additional vocals of Kerry Ramsey, one half of the Bad Owl setup. Her delicate vocals are well-suited to both the material and Morris’ voice, and varying the arrangements in this way sees the hour-long set pass far too quickly. ‘I Am Gone, I Am Gone, I Am Gone’ is hushed, low, moody, and the set’s closer, ‘Your Life in Pictures’ is a tense epic that builds and burns with the drama of Her Name is Calla at their best. It’s a powerful sign off, although it’s hard to feel too distraught on leaving the venue. It’s been a celebration of a significant period of Tom Morris’ musical career, with many familiar and friendly faces in attendance. More than that, the knowledge that he’ll be focusing his creative powers exclusively on Her Name is Calla, who have been finding outstanding form of late, gives reason to look to the future with anticipation. Sunn O))). The band who have essentially launched doom / drone into a whole new domain and transformed a microniche into something that’s as immense as the sound they create. It’s utterly perverse. There should be about fifteen people digging this band, not because they’re not unspeakably intense and remarkable in every way, but because, well, they’re simply not accessible. But these are dark times, in every respect. Musically, lamecore rap / r’n’b continue to dominate the mainstream, while an endless procession of limp-dicked tattoo-sporting clones rules the world of the ‘alternative’ and ‘rock’ scenes. Outside music, art and literature has been diluted to the lowest common denominator, and in the realms beyond that, the world is at war and the rich get richer while the poor slowly sink. None of this feels like progress. This is the hour for a band like Sunn O))), and so it is that they are the chosen band to lead the way through the darkness of the modern world, and back to the caves which offer a safe haven in the woods from the inanity of the 21st century. Sunn O))) evoke deep, primal sensations while simultaneously conjuring reflections of the shadows which currently cover the earth. But what of their progress? There’s no question that Monoliths and Dimensions was something of a watershed, and marked a huge leap in their evolution – something akin to shedding gills having developed lungs. It’s hard to credit that Monoliths was a full six years ago now, although the band and their members have hardy been resting on their laurels, what with their multitudinous other projects. And then of course, there was Soused, their collaboration with Scott Walker, an album that encapsulated the growling, low-end doom drone sound that’s synonymous with Sunn O))), while also demonstrating a remarkable degree of subtlety and restraint. Casting reflections back to the last Sunn O))) album proper, Monoliths and Dimensions, an album consisting of but four tracks, felt like a leviathan work at the time. That still stands, and their latest offering certainly doesn’t undermine any of their previous work. And nor does it deviate too drastically from it. It’s certainly no criticism to observe that the band’s output is centred around variations on a sonic theme. Would anyone really want Sunn O))) to release an alum of rap covers, or to diversify into punk pop? Yes, that is a rhetorical question. Sunn O))) are undeniably the leading exponents of heavy, droning doom, and in the field they’ve laid out for themselves to harvest at will, Kannon excels. Kannon contains only three tracks, simply numbered I, II, and III. Its running time is a little over half an hour. All things considered, it’s pretty concise, and while the band’s eternal debt to early Earth (in particular the pivotal Earth 2) is abundantly evident once again, the album’s comparative brevity is indicative of a band with a shifting focus and a determination to evolve, albeit at a craw. ‘Kannon I’ is a deliberate, trudging piece that builds through wraiths of sculpted feedback. Through the sonic fog, guttural snarls, wordless and inchoate, and resembling the growls of the zombies in The Walking Dead cough and splutter. Rising from the lung-shaking drone are layers of sound, soaring textures that straddle ambience and shoegaze. To dismiss Sunn O))) as merely priveyors of grinding, bottom end dirges is quite simply wrong. ‘Kannon II’ slows the pace to less than a crawl: the harmonics which emanate from the alternating low-end powerchords and whorls of feedback stream from the speakers at barely a single beat per minute. Monastic chants rise ominously as if we’re party to an occult ceremony celebrating the end of days. For all I know, we perhaps are. It culminates in a deep, rumbling explosion, which quite conceivably sounds the way a distant planetary body collapsing in space as captured by an orbital probe may sound. And my terror deepens. ‘Kannon III’, clocking in at just over eleven minutes, is the most overtly doom-metal. The monastic vocals give way to an anguished howl of ruined vocal chords, a black metal burial. Yet, at the same time, it soars, conjuring ideas of a new, bright future arising from the wreckage strewn by the obliterative maelstrom of downtuned guitars. 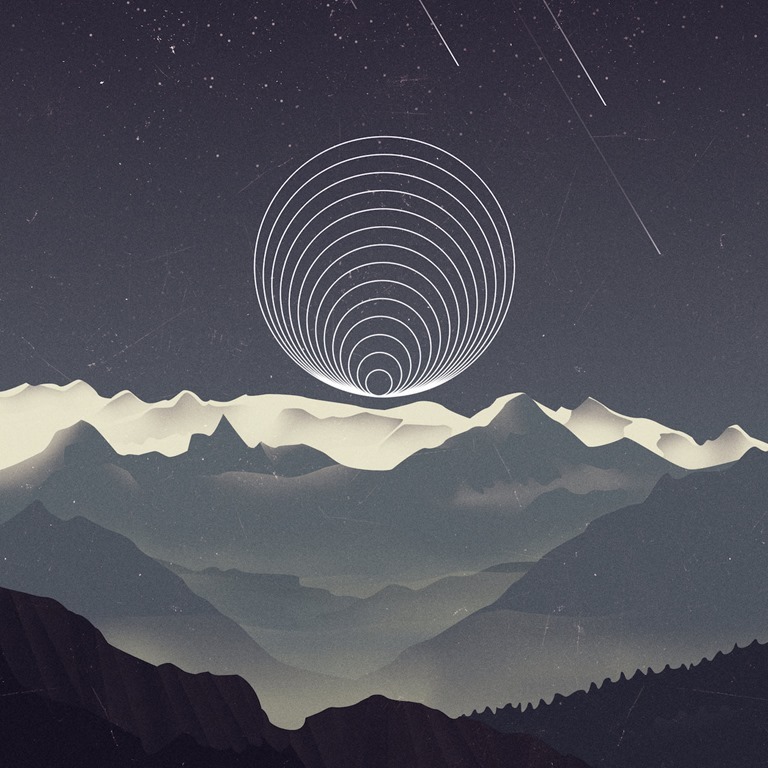 Simultaneously ruinous and redemptive, the vocals rise from the abyss… but to where? 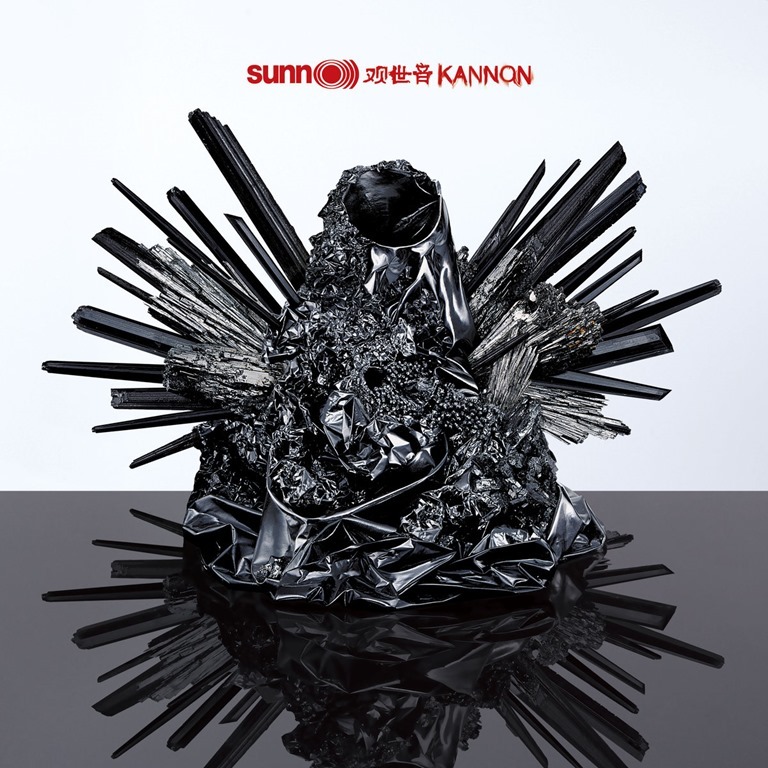 Kannon is no lazy rehash of all Sunn O))) have done before. Of course it’s a brutal, dark celebration of the dark side, dominated by shredding power chords of tectonic force. And of course it’s theatrical, preposterous in its scale. It’s a Sunn O))) album, after all, and anything less than megalithic would be an immense disappointment. Kannon doesn’t disappoint on any level. Its scale is practically unfathomable, its scope and ambition virtually unparalleled. Quite simply, it’s a monster, just as anyone familiar with the band knew it would be. Utterly magnificent. 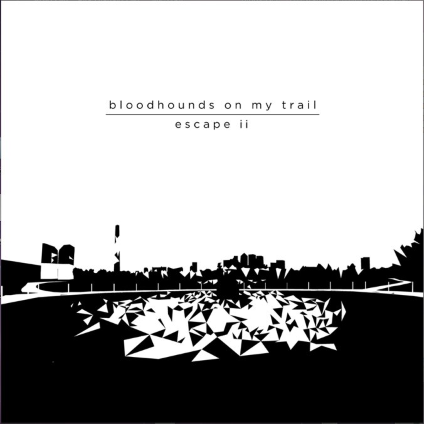 As beautiful bursts of reverb-heavy psychedelic-hued cascades of shoegaze dream-pop in the vein of ‘Nowhere’-era Ride go, Escape II; by Melbourne-based Bloodhounds On My Trail is hard to beat. ‘Jolly’ may fail to live up to its title, but is a shimmering cascade of guitars which taper into diffusing contrails as the sound disperses to nothing is a glorious and elegant sunburst for the ears. Meanwhile, ‘Old Fools’ perfectly blends lead guitar lines that soar and chime in soft-focus against a heavy mesh of trebly overdriven noise, the vocals floating in the background and serving almost as another instrument as they drift in a cathedral of reverb. The six-minute ‘She’s in My Plans’ is a beautifully dreamy meanderer which has an underlying emotional pull that’s hard to pinpoint and all the more powerful and emotive for it. The Ummagma remix of ‘Jolly’ wraps things up nicely, the Cocteau Twins meets I Like Trains guitar chimes wrapped in layers of cotton wool and cloud-like synth. Steeped in the 90s sound as it may be, but Escape II is a magnificently realised set, and features some outstandingly atmospheric songs that pitch the calm and the storm together in the most effortless fashion.